Back home for Thanksgiving after playing Austin City Limits and a date supporting M83, brother-sister duo Tennyson treated Edmonton to a lively set on the last day (October 9) of Up+Downtown Music Festival. Luke and Tess Pretty have been getting big internet buzz over the last few years, having released a few EPs and numerous singles on Bandcamp and Soundcloud that garnered comparisons ranging from Flying Lotus to Badbadnotgood. The siblings are incredibly young (Luke is 20, Tess is 18) for their talent level. Luke, dressed in an Adidas tracksuit behind a setup of keys and samplers, twisted and jumped (literally) from manning MIDI controllers to playing swirling jazz riffs on the keyboard to triggering samples with a drumstick. His style of jazz-infused electronic music is perfect for dancing, but the underlying elements are largely tranquil. 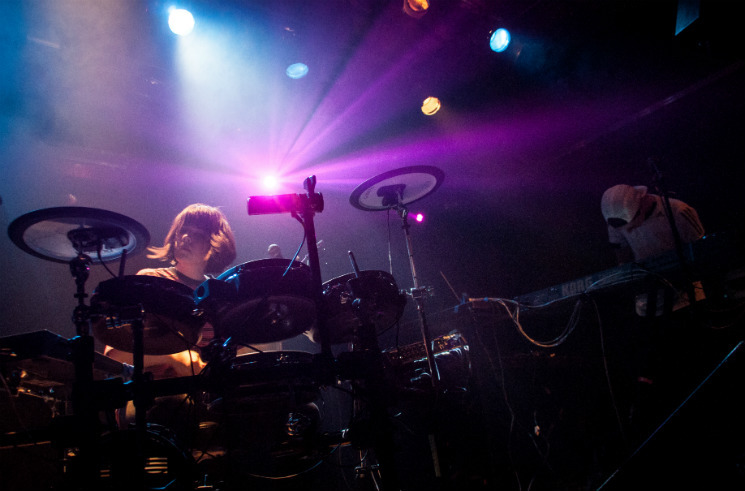 Tess glued her brother's frantic arrangements together on an electronic drumkit, anchoring the sounds with complex rhythms. Throughout the set, Luke and Tess were all smiles, despite some equipment and monitor problems. The overjoyed Tess took some selfies with the crowd before Luke exclaimed, "This one is a banger," and they launched into the frisky "Slipperz." The holiday Sunday night crowd was highly receptive and demanded an encore to which the duo responded by playing their tongue-in-cheek jingle "Tomato Land." Tennyson were clearly having a lot of fun onstage, but it being a rare hometown performance made it that much more special.